The popularity of gathering to watch a sporting event while not actually attending the event can be traced back to the first televised World Series baseball game in 1947. Much has changed since the time of that epic battle between the Brooklyn Dodgers and New York Yankees. Today, sports fans can watch games from the comfort of their own homes or attend arena-sized viewing events like the recent Stanley Cup Finals game in Pittsburgh. Nevertheless, sports bars continue to draw crowds. While some have come and gone, successful sports bars know what it takes to bring together all types of people — for sports plus food, fun, and drinks. Draft Republic, a gastropub known for its extensive tap list, first opened its doors in San Diego at Regency Centers’ Costa Verde shopping center. 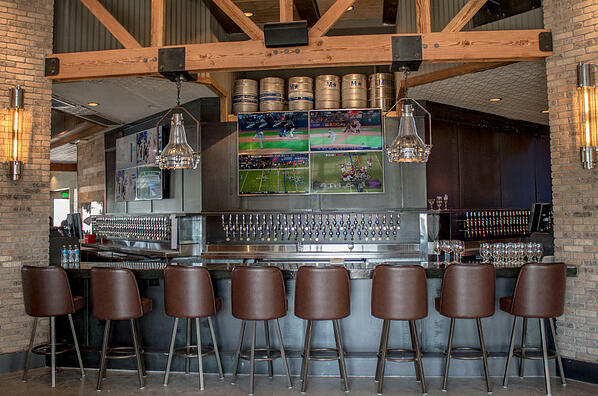 This unique open-concept sports bar has since opened its second location in Carlsbad—a 12,000-square-foot space designed by Philippe Beltran. Featuring 101 taps with “strong San Diego representation,” Draft Republic exemplifies the modern successful sports bar. With rare international brews and extraordinary in-house sausage creations, Draft Republic Carlsbad brings a lot more than sports to the table. TVs and projector screens are mainstays of today’s sports bar. However, other forms of entertainment such as video games and tabletop sports, live music, and other engaging activities help to attract more than only die-hard sports fans . For example, Draft Republic Carlsbad offers 50 televisions plus ping pong, billiards, and video games. At Draft Republic Carlsbad, Executive Chef Mike Camplin will reproduce the in-house sausage production that quickly became a local favorite first at Draft Republic Costa Verde and will feature new additions like grilled New Zealand lamb chops, a banh mi “ramen” burger and four flatbreads, according to Eater. Tara Bowers, owner of Major League Sports Bar, a 25-year establishment in Sugar Notch, PA also attests to the fact that food is a big draw in the sports bar business. Finally, let’s not forget the drinks. The craft beer market continues to drive demand and impact beverage consumption. As recent reports suggest, unique flavor and processing methods of craft beer increasingly appeal to today’s consumer, thus driving sales and trends in the market. Draft Republic offers craft beer and an interesting blend of cocktails. Today’s sports bar will bring together these elements and more to ultimately provide an enjoyable, engaging experience that gives people a reason to leave their homes for sports, food and drinks, and ultimately — fun.